Chinese New Year begins on Friday — the Year of the Dog! As the author of the Down Girl and Sit series, it’s common knowledge that I love dogs. And I love living in a neighborhood that appreciates dogs as much as I do. So to celebrate the Year of the Dog, I’m going to feature a dog-related post here on the blog every Walkabout Wednesday. Or, at least, I’ll try to. That will be 52 of them. Yep. 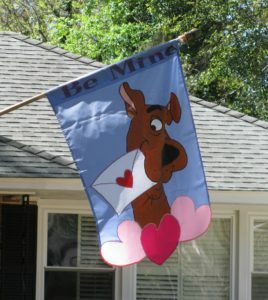 This week, I’m kicking off the Year of the Dog early — on Valentine’s Day — with a picture of this neighborhood Scooby Doo flag. Scooby Doo has always been one of my favorite fictional characters. In fact, I consider the classic Scooby Doo cartoon series to be one of my major literary influences. I loved Scooby Doo as a child…and I love him just as much as an adult. I once sat in a hotel room deep in Siberia, watching Scooby’s antics on TV, and laughed as much then as I did when I was seven. I couldn’t understand a word he was saying, but, then again, I didn’t need to. The cartoons make just as much sense in Russian as they do in English. Scooby Doo — like love — speaks a universal language. So, with that being said, Happy Year of the Dog!